In a recent study of accidents involving large trucks, the U.S. Department of Transportation found that "inadequate surveillance," which means the driver failed to look or did not see the other car, was an associated factor in over 13% of truck accidents studied. This also accounted for the fifth most common type of truck driver error. Many of these accidents occurred because the truck driver did not sufficiently check for another vehicle in the truck's blind spot before stopping, turning or changing lanes. If you’ve been in a truck accident, it’s important to recognize the law in these cases is very specialized. The experienced Atlanta truck accident attorneys at Katz Wright Fleming Dodson & Mildenhall LLC, LLP understand the complexities involved in holding truckers accountable for their negligence while also defending against the attacks of the insurance company lawyers who try to hold the injured car driver responsible for causing the accident. 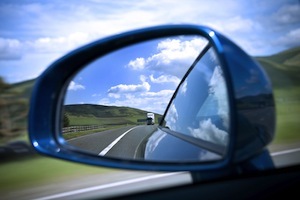 Most cars have blind spots toward the rear on both the right and left sides of the vehicle. Large semi-trucks and tractor-trailers, however, have much larger blind spots to deal with. This, in turn, creates a greater responsibility to check those spots and take care before making any turn or lane change. Like cars, 18-wheelers have blind spots behind the cab on both sides. But for the big-rig, the passenger-side blind spot extends rightward and rearward across several lanes of traffic. In addition, the semi is blind to the area behind the trailer for more than one car length. The truck driver typically cannot see the area directly in front of the cab and to the right for one full car length. Calling these areas blind "spots" is misleading, since there are entire regions of the road on all sides that are basically invisible to the trucker. Whole cars can disappear from a trucker's sight, creating a very dangerous situation if the driver isn’t extremely careful. Through commercials, billboards, and bumper stickers, the federal government and trucking companies try to raise public awareness about blind spots surrounding a tractor-trailer, warning drivers not to "hang out" in the "no-zone." While this is good advice, it is not always possible. Whether attempting to pass a truck or due to the surrounding traffic patterns, it may be necessary to drive for a time in a trucker's blind spot. Truckers know this, and they know they have a duty to signal their lane changes and turns well in advance and also use their mirrors. Changing lanes without checking first is "inadequate surveillance" that amounts to negligence on the part of the driver. To shift attention away from truck driver negligence, insurance companies often try to avoid responsibility by claiming an automobile driver was negligent for driving in a blind spot. If you are in this situation, it is very important that you hire the best truck accident attorney to argue strongly and effectively against this claim. If a jury decides you are to blame in causing the accident, you may be prevented from recovering compensation, despite the trucker's obvious negligence. In any truck accident case, you need a skilled and knowledgeable attorney who can stand up to the insurance company and make sure the blame for the accident is properly placed where it belongs. You also want an experienced lawyer with a record of success obtaining compensation for individuals who have been seriously injured in a catastrophic accident involving blind spots or other trucker negligence. In Georgia, contact the law offices of Katz Wright Fleming Dodson & Mildenhall LLC for a free consultation with an experienced truck accident personal injury and wrongful death attorney. We represent clients that have been involved in accidents on the state’s main thoroughfares, including I-75, I-85, I-20 and other high speed roadways.